If you have one of those sites full of the latest pluggins linking all the social media pluggins available to mankind it may actually have a detrimental effect on e-commerce sales. Recently I purchased printing from a site that in terms of usibility would be considered a failure by accepted standards. However I rang a number of printers all who had better sites than this but the phone manner and professionalism on initial contact convinced me the printers with the supposedly poor website were my choice. They got the job with the initial source of enquiry being coreflute signs Gold Coast. Being curious, when picking up the signs (which were excellent) we discussed the merits of the website. It turns out it is a nice little earner. When looking to purshase printing material I wasn't remotely interested in how many Facebook likes or Instagram pictures they had. I wanted to know if they could print my stuff at a reasonable price with no surprises. "social media as a strategy doesn't account for much in terms of sales generation"
Online Searches remain the greatest source to e-commerce visits. "A report by Monetate found that despite considerable brand investment, social media is much less effective than other electronic marketing strategies as a direct e-commerce traffic source. 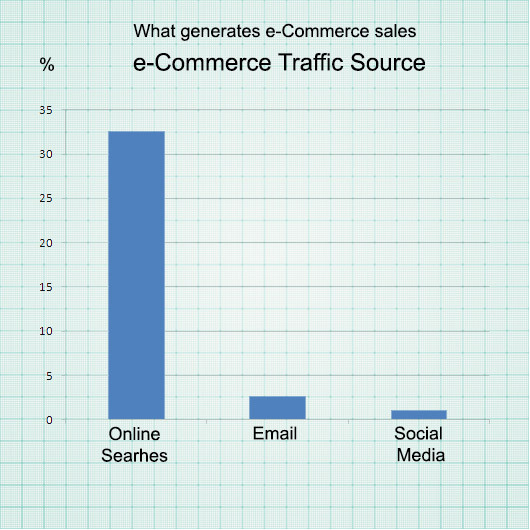 Online searches were the greatest contributor to e-commerce visits and sales, representing 32.61 percent of traffic. Even email, at 2.72 percent, outperformed social media, which the study said accounts for a meager 1.14 percent of all e-commerce traffic." "Rather, ask yourself how much time you spend on social media every week. Now multiply that by 10 — that’s how much time you should spend on your SEO."